Drawing of a whispering stick. 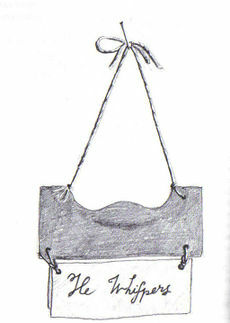 Drawing of a whispering stick, with an additional sign: "He Whispers". A whispering stick was a kind of wooden bit gag that teachers in colonial America used to punish a child who had been whispering in class. It consisted of a short length of stick or a flat board to which ends were two strings attached. The child had to take the stick in their mouth and the strings were tied behind their neck.